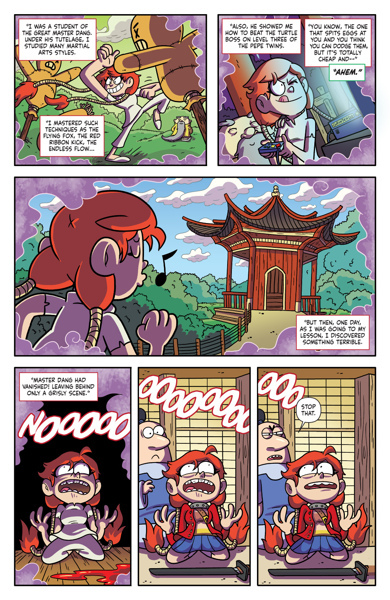 Daily Illuminator: Munchkin Comics #22 In Stores Now! October 26, 2016: Munchkin Comics #22 In Stores Now! The doors are barricaded, the undead are about, and the kung-fu masters are fighting – it must be new comic day! Some of your favorite Munchkin-comic writers and artists join forces in issue #22 from BOOM! 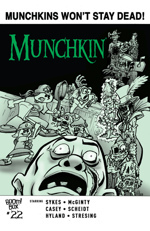 Studios, starting with a Munchkin Fu Guest Artist Edition story – "Munchkin Fu: The Legend Continues." Flower journeys far and wide to avenge her master. She faces many tests of questionable origin . . . honestly, she may be making up a majority of the tests. We really can't be sure. 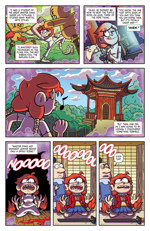 But there's a lot of kung-fu action, written by the amazing Sam Sykes and illustrated by Ian McGinty (artist for Munchkin Guest Artist Edition and Munchkin Knights, among others). It's Halloween, of course, so the issue wouldn't be complete without a horde of the undead! Humans are being selfish and holing up in the bowling alley during a zombie apocalypse. But when the undead want to use the lanes, they fight in the deadliest form of combat – bowl off. Can the humans avoid the gutter, or will they fall to the (surprisingly talented) zombies? 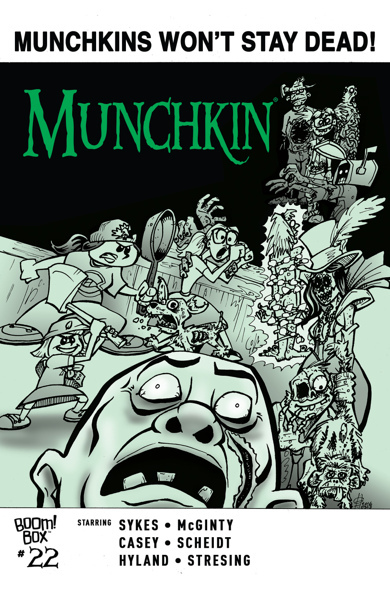 This shambling story was written by David Scheidt, with art from Greg Hyland, who also illustrated the recently released Munchkin Zombies Guest Artist Edition. Pick up your copy of Munchkin #22 at your friendly local comic shop today! Unless you're a zombie, then you should probably find your nearest bowling alley. And don't forget your BOOM! Bundle bookmark promo code in the back of the comic, redeemable on Warehouse 23.